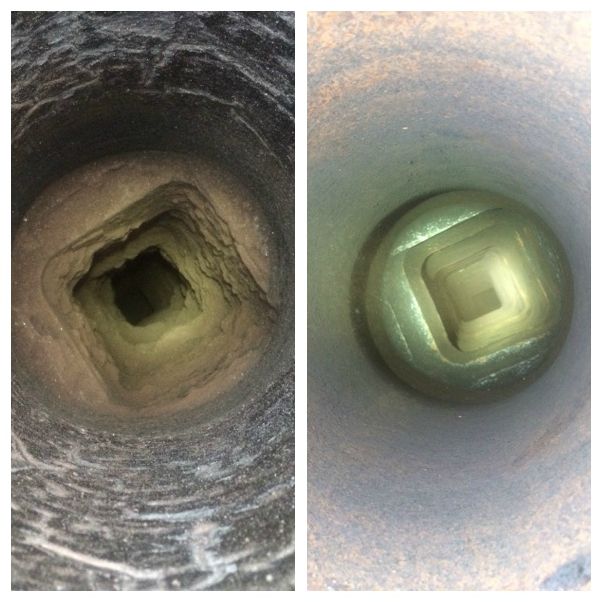 Power Sweeping is a revolutionary way of cleaning chimneys, it consists of a high torque drill connecting to very strong but flexible rods. These are sent up the chimney with a hexagonal shaped polypropylene stranded flail and rotated at high speed. This is far more effective than traditional rods and brushes. It is particularly effective of removing tar and creosote from flue liners when using the wire strands or chain attachments. 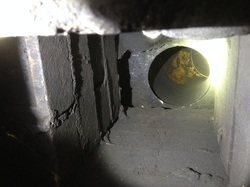 Here are some pictures of a Chimney flue before power sweeping. All solid state creosote is now remove vastly improving the flow of combustion gases, increasing draw and vastly reducing the risk of a chimney fire. 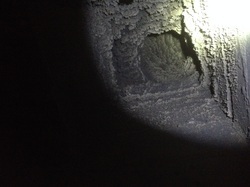 This was a very heavily tarred chimney caused by slow burning or "slumbering" the appliance. This was connected to a wood burning stove that was not providing enough heat to sufficiently heat the flue. The smoke and wood vapour cool and reform as tar within the chimney potentially blocking the flue or high risk of a chimney fire. These fires can exceed 1000oC causing damage and even destroying properties due to the heat transfer through brickwork of the chimney igniting roof joists and spars within the loft space.